All magnetrons supplied by AEP are fully form fit and functional replacements for the same types mentioned by the linac manufactures as shown in the cross-reference table by magnetron type number. Can you use the magnetron M5028 in Elekta SLand Sli machines? e2v Technologies and AEP confirm the M5028 magnetron can be used in the Elekta SL and Sli machines. The M5028 is fully form fit and function replacement for the MG6363 magnetron. Can you use the fast tuned magnetron MG6028 in Elekta Sli machines? e2v Technologies and AEP confirm the MG6028 precision tuned magnetron can be used in Elekta Sli machines. The MG6028 is fully form fit and function replacement for the MG6370 magnetron. Can you use the magnetron MG5193 in Varian magnetrons machines? For the Varian machines which are normally fitted with a magnetron type MG6165, AEP confirms the MG5193 is fully form fit and function replacement for the MG6165 magnetron. Can you use the magnetron MG5193 in Siemens Primus magnetron machines? AEP confirms the MG5193 can be used in the new Siemens Primus machines which are normally fitted with a magnetron type MG6250. The MG5193 is fully form fit and function replacement for the MG6250 magnetron. What is the situation with the M5167 magnetron? In regards to the supply of the M5167 magnetron we can inform you that Marconi has ceased production of this type and replaced it with the MG5193. This tube is form fit and function replacement. What is more, the MG5193 has a higher average power capability than its predecessor. What magnetron replaces the discontinued MG5349 and MG5349M? e2v Technologies and AEP advise its customers of the discontinuation of magnetron products MG5349 and MG5349M. These products have been superseded by magnetron MG6090, which e2v and AEP consider as a direct replacement that includes performance enhancements. The MG6090 series of magnetrons have been developed to replace the MG5349 series of products. Designed specifically for linear accelerator use, these new magnetrons are RoHS compliant and robust. For transport considerations, the MG6090 magnetron is able to withstand a shock of up to 101G in magnitude; three times that of the MG5349 series predecessors. 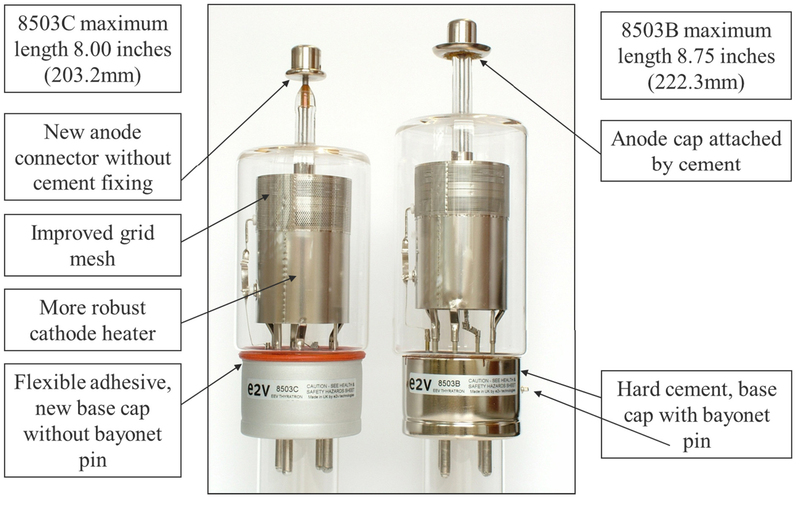 In addition, high voltage leads and connectors have been upgraded to minimize stray microwave radiation from the product during operation. Can you use the thyratrons CX1154 or CX1154L in SL Series Linacs? The CX1154L is recommended for old SL75-20 machines: machine numbers < 5001. These don’t have a critical timing. CX1154L is recommended for use in all machines WITHOUT a slitted flight tube, which are machines with a serial number > 5361. The CX1154L is NOT recommended for SL15/18/20/25which still have the slitted flight tube fitted: these are machines with a serial number from 5001 to 5361 inclusive. In machines that have had the SLITLESS flight tube upgrade the CX1154L thyratron may be used as replacement and will fit into these machines. The CX1154L has been fitted by Elekta into all new machines made after end of 1999. Todays Sli’s machines are all standard fitted with a CX1154L thyratron. 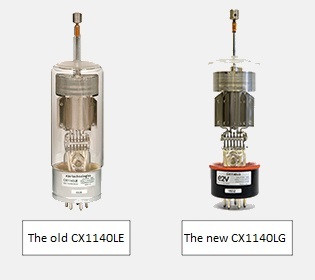 What is the difference between CX1140LD and CX1140L? The only difference between the CX1140LD and CX1140L is that the CX1140LD is filled withdeuterium and the CX1140L is filled with hydrogen. Deuterium gives a higher voltage hold-off, with the same filling pressure, than hydrogen. The CX1140LD, therefore, is completely interchangeable with the CX1140L used today for newly built LINAC and spare parts. What is the difference between CX1140LD and CX1140LE? Recently e2v technologies decided to further improve the design of the CX1140LD. As a result of these changes e2v decided to change the type number of the CX1140LD thyratron into type number CX1140LE. The most important change to the thyratron has been to improve the metal mesh enclosing the high voltage electrode. This to improve the lifetime expectancy of the thyratron. It’s superior characteristics and performances have been confirmed by a extensive test program. What is the difference between 8503AF and 8503AG? Thermal characteristics of the heater are unchanged and there will be no effect on operation of the thyratron in your radiotherapy equipment. It’s superior characteristics and performances have been confirmed by a extensive test program. Can you use the modified CX1154L on all Elekta machines? In collaboration with Elekta there is a small design change to the grid 2 structure and the CX1154L is now filled with hydrogen, not deuterium. This results in a faster recovery time and therefore the effect is that the new design CX1154L can be used with ALL Elekta machines, even the very old ones. 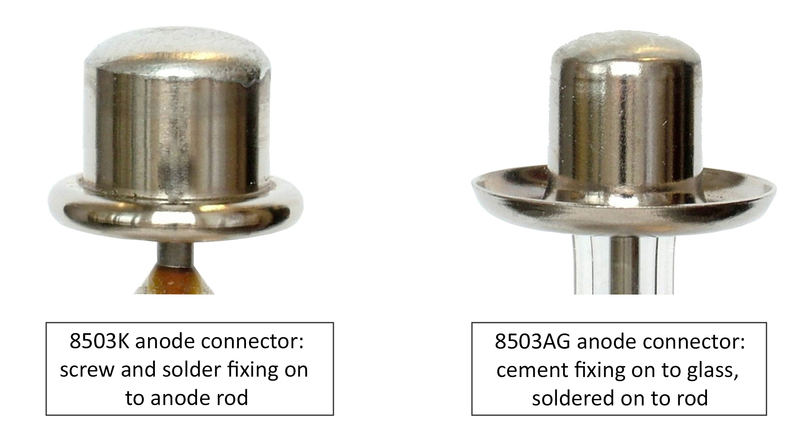 Modified CX1154L design introduced from s/n 28528 (WK 33 2009) can be used and retrofitted to all CX1154L & CX1154 Elekta sockets. What is the difference between CX1140LE and CX1140LG? What is the difference between 8503AG and 8503K? What is the difference between 8503B and 8503C?